Trio Isimsiz was formed in 2009 at the Guildhall School of Music & Drama under the guidance of Louise Hopkins, Carole Presland and Alasdair Tait. In 2013, the group was selected for representation by Young Classical Artists Trust, and in 2015, they won 1st prize and the Audience Prize at the Trondheim International Chamber Music Competition. Trio Isimsiz have a busy concert schedule, regularly giving recitals throughout the UK at venues including Wigmore Hall, Barbican Hall, Royal Festival Hall, the Purcell Room, Barber Institute Birmingham, The Sage Gateshead, Brighton Dome, and Colston Hall, Bristol. 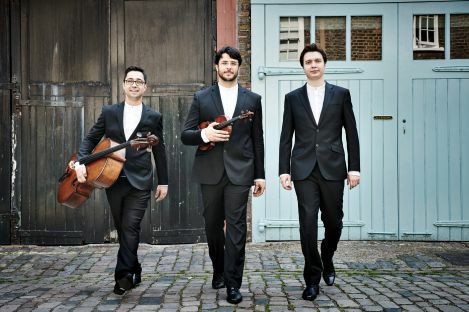 They have taken part in master classes with Menahem Pressler at Wigmore Hall, Steven Isserlis at King’s Place, and the Gould Piano Trio at Dartington. They have also been on two residencies at the Mozarteum in Salzburg, where they worked with Pavel Gililov, Wolfgang Reddick, and Thomas Riebl. Recent highlights outside of the UK include concerts at Festspiele Mecklenburg-Vorpommern, Tivoli Concert Hall in Copenhagen, Stavanger Kammermusikkfestivalen, and the Juan March Institute in Madrid.